While Everest Poker is still a comparatively young online poker room they managed to establish themselves as on of the 10 most popular poker rooms in a short time. Reasons may be the multi-lingual availability of their software or the fact that talented players can make some nice money because quite often you will find that some players are just a bit too careless even at games above the low limits. The first deposit bonus is definitely one of the fairest offers in the industry both in terms of money offered for your deposit as well as how to clear it. There are constantly new promotions on offer but the main reason for this room's popularity probably are the already mentioned lose games that you may even come across in the higher limits which translates into easy winnings for experienced players. Add to that a rake that is capped at $3 and not deducted at all if there is no flop - unfortunately that doesn't go without saying in your average online poker room. The VIP Summit Club at Everest Poker (which you will have to register for manually when logged into your account, registration is free and uncomplicated) is worth taking a closer look at. Not only will you receive up to 750% of your Summit Points (that can be converted into cash each month, starting from $50 at the lowest VIP level up to $5,000 at the highest level), you will also receive special attention from the support team, be eligible for special VIP tournaments and Everest Poker even offers you the chance to exchange your Summit Points to real money in order to register at a live tournament and will handle the whole registration process if supported by the host of the tournament. One of the most popular satellite offers of Everest Poker is the opportunity to qualify for the European Poker Tour (EPT). You can win a $12,000 EPT package each week by either directly buying into the $200+15 Winner's Choice Tournament on Wednesdays or qualifying via one of the daily $5+0.50 satellites. The Everest Poker Summit Points Program is probably one of the most generous in the online poker industry and the points you earn can be used as Buy-In for real money tournaments among various other things. They also offer the possibility to qualify for numerous famous live tournaments such as the Word Poker Tour (WPT) or the World Series of Poker (WSOP). Buy-Ins for these qualifiers start at $1.20. If you are interested in qualifying for either EPT, WPT or WSOP we strongly recommend you read Bernd's blog post on satellite strategy. 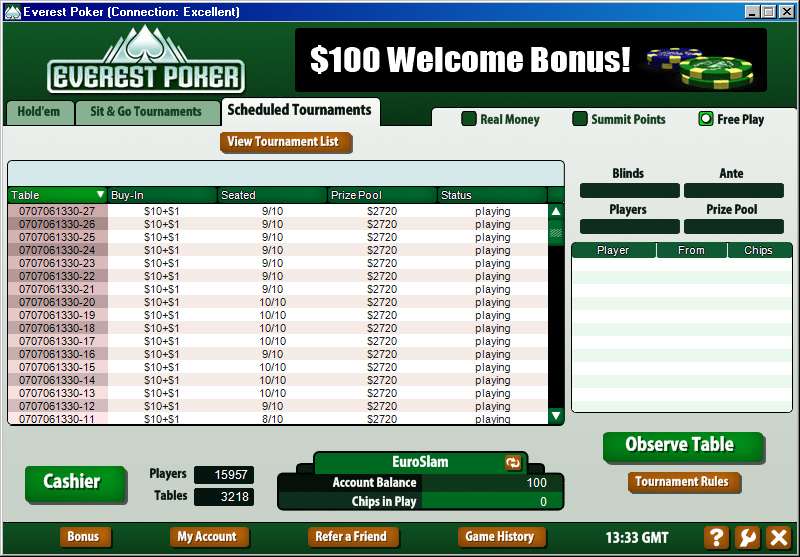 The software used by Everest Poker is very well developed and very fast while being stable. The client is also available in various languages. The lobby is generally very well laid out and you are able to check the average pot and percentage of flops viewed while in the overview of the tables which helps determine where to sit down. Another comfortable extra is the option to view the list of tournaments that you have already registered for. Once you are seated at a table you will find that the design has been optimised for easy use - some players might prefer a fancier, more detailed design but in general poker players really enjoy the simplicity of the table layout. You are also able to replay your hands which can help in elevating your game as well as when contacting support with a specific request. 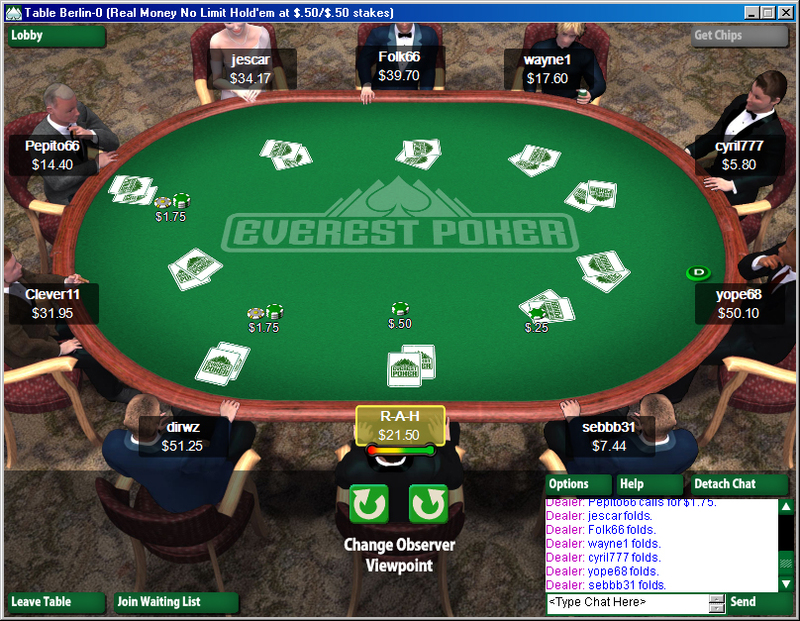 Everest Poker belongs to the top 10 poker rooms regarding player traffic. Experienced poker players are lured by big winnings as well as numerous qualifiers for prestigious tournaments such as the World Series of Poker or the World Poker Tour. A very fair raking system and excellent rewards for loyal players sweeten the deal even more.